My final year project at university has been the subject of previous posts and today I wanted to share with you where we got to. I worked with Alex Hussey to provide an app based solution for the RSA Student Design Awards brief entitled ‘Heritage by Design.’ Our aim for the project was to create an attractive design for an app or system that would help people and communities better connect with and celebrate heritage. We conducted various interviews and research sessions with potential users in order to accurately identify what would be necessary to implement a system of this scope. 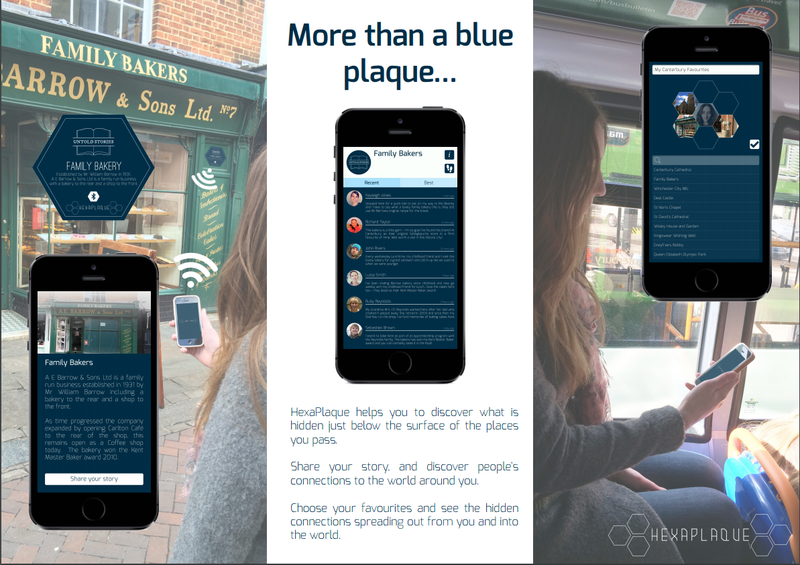 The final design, HexaPlaque, allows users to share their stories with the world, and to see how they are connected to the world around them. Learn about HexaPlaque in 250 words. View our poster we created for the university project fair which gives a high level view of our research and simplified storyboard of the final solution. Then watch the story of HexaPlaque in PowerPoint to see our complete journey. See the Design Evolution of a HexaPlaque – our alternative to the traditional blue plaque. Alex and I received the Kent Innovation and Enterprise Prize for Computing 2015 for HexaPlaque. The award recognises the Final Year Undergraduate Student Project that is both innovative, and impactful to the range of external clients that the Kent Innovation and Enterprise Centre engage with. There was some initial interest from Canterbury council but at the moment Alex and I are concentrating on other adventures. However, we’d love to hear from you if you’re interested in our project HexaPlaque and it’s future.